I have two children that take packed lunches to school. One of them is a fussy eater and the other has dairy allergies, so I find I have peace of mind sending them to school with food I know they will eat. It can be a challenge making sure they don't get bored of the same foods so I am going to let you in on what is in our lunchboxes and how we keep the kids excited about a packed lunch. I try to make sure that whatever they eat is completely balanced and so they always have either a sandwich or wrap, with alternating fillings so they don't get bored. I then make sure that Gracie has something full of calcium usually some kind of cheese or yoghurt or both. I am yet to find any dairy free cheese or yoghurt that tastes nice for poor Zach, suggestions more than welcome! Both of them love their fruit and so they tend to have two pieces of fruit with their lunch. Whether that be a large piece like a banana and a small pot of grapes, strawberries etc. or sometimes they have a little fruit salad made up in a pot with a variety of their favourite fruits. They also each have a packet of crisps in their lunch each day. This is usually a small packet and more for filling them up than nutritious value, as being at school all day can use up a lot of energy. To make things a bit exciting, they tend to have a little surprise in their lunch box each day. This can be anything from a small box of raisins to a slice of cake or a pot of jelly. I know many people don't agree with giving children unhealthy foods in their lunchbox but I think if in moderation it certainly doesn't hurt them. For them it is the surprise factor that they don't know what will be in it until they open it up at lunch time, sometimes it is healthy treats and others less so but they always come home talking about what they had for lunch and thanking me for whatever surprise they have found. The way to my kid's heart is definitely through their stomach. At the moment Hartley's jelly have a great promotion, where you collect 12 lids from their no added sugar jelly pots (115g) to claim a free Hartley's lunchbox and stickers. They also have a large range of flavours available. 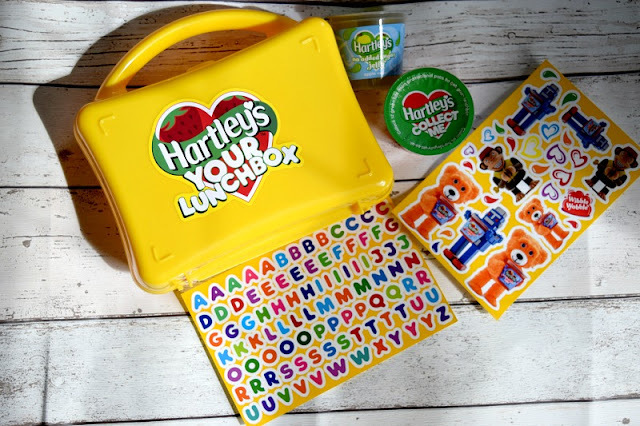 My kids love the Hartley's jelly pots and love their special lunchbox! This post is an entry for BritMums #HartleysYourLunchbox Linky challenge, sponsored by Hartley's Jelly. All things in moderation! Commenting for myself and on behalf of BritMums and thanking you for taking part.